Located in the north-west of the Central Siberian tableland, the Putorana plateau is its most elevated part. Steep slopes separate the plateau from the rest of the region in the west, north and east. In the south, it slopes gradually towards the Syverma plateau; the boundary between the two passes approximately along 66°N. The name of Putorana, which in Evenk means 'lakes with steep shores', summarizes the major features of its landscape. The plateau was first mapped and described between 1725 and 1730 by Chichagov (Magidovich and Magidovich, 1984). The first detailed map was not completed until the 1940s when aerial photography was available and the elevation of it highest summit (Mount Kamen, 1664 m) was established at the same time. The Putorana plateau is a morphostructural element of the Siberian platform. In the Paleozoic, the region was a part of the subsiding Tungus basin. The Paleozoic platform cover consists of sandstone, aleurite, argillite, and coal strata exposed along the western and eastern margins of the plateau (Figure 13.5). In the late Permian and Triassic, the rigid block of the Central Siberian tableland was broken by the Variscan orogeny and volcanic rocks intruded the Paleozoic strata and extruded on the surface. Potassium-argon dating has shown that volcanism began in the Putorana around 240 Ma BP and reached its peak around 235-220 Ma BP (Zolotukhin and Almukhamedov, 1988). Central Siberia is one of the few regions in the world that experienced extensive basaltic magmatism. Originally, volcanic rocks are believed to have covered an area of about 1.5 x 106 km2 with an average thickness of about 1 km. At present, the extrusive basalts occupy about 337 thousand km2 with a magma volume of about 337 km3 (Ravniny i gory Sibiri, 1975) which places the Siberian flood basalt province among the world's largest such as the Columbia river province in the north-western United States and the Deccan Traps in central and north-western India (Basaltic Study Project, 1981). Over 90 per cent of the Siberian basalts occurs in the Putorana and the high elevation of the plateau is partly due to the great thickness of the lava which in its central part reach 2000 m (Ravniny i gory Sibiri, 1975). Products of fissure eruptions occur in a variety of conditions: as blanket deposits 20-150 m thick interlaid with tuffs and sedimentary rocks (termed traps), thick dykes and columnar structures. Associated with the intrusions are the deposits of copper and nickel. The largest deposits occur at the western margin of the plateau in the Norilsk region and because of their economic importance regional geology is well researched and a wealth of literature is available. A review paper by Zolotukhin and Almukhamedov (1988) on the Siberian basaltic province is recommended to English-speaking readers as well as papers by Nesterenko et al. (1991) and Sharma et al. (1991) which deal with the Putorana traps. Between the upper Cretaceous and the Neogene, the Putorana had a stable regime and under the conditions of subaerial exposure underwent prolonged denudation. At the end of the Neogene-beginning of the Pleistocene, the area experienced an upwarp reaching 800-1500 m. A system of faults, centred on Lake Ayan developed, breaking the swell into individual mountainous massifs separated by deep, narrow valleys which now contain rivers and lakes. The uplift of the area continues. There is a difference in opinion on the number of glaciations in the Putorana region in the early Pleistocene. According to Isaeva et al. (1986) the area was glaciated once whereas Alekseev et al. (1984) distinguish two separate glaciations. A similar controversy exists concerning the middle Pleistocene glaciations: Isaeva et al. 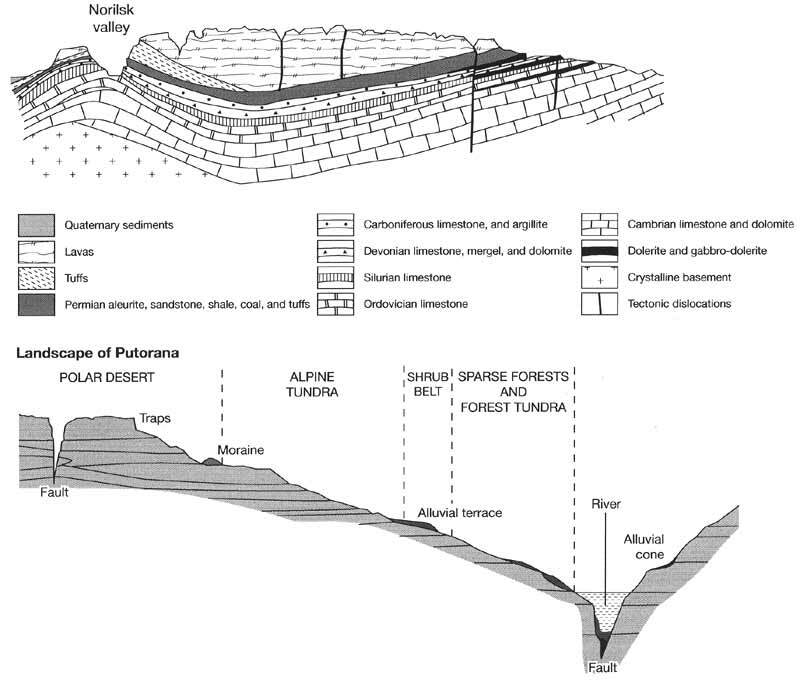 (1986) suggest that the Putorana was glaciated twice, while Arkhipov et al. (1982) recognizes three glaciations. In contrast to the North Siberian lowland, where the Quaternary stratigraphy is relatively well preserved, tectonic movements and a lack of organic deposits limit the availability of the reliable Pleistocene sequences in the Putorana and only the late Pleistocene environments can be reliably analysed. Four stages are distinguished within the late Pleistocene: Kazantsevsky interglacial, Zyryanka (70-50 Ka BP) and Sartan (22-15 Ka BP) glacials separated by the climatically complex Karginsky interval (see Table 2.1 and Figure 2.3). Deposits of Putorana origin found in the valleys of the Khatanga and Kheta suggest that the plateau was one of the centres of the Zyryanka glaciation in northern Central Siberia (Isaeva et al, 1993). In the early maximum stage of the Zyryanka, the Putorana ice sheet merged with those of the Byrranga and Anabar centres and formed a single cover which occupied the northwestern sector of the Central Siberian tableland (Isaeva, 1984). The Karginsky interval included three warmings and two coolings and it is possible that during the early warming at 40-45 Ka BP the climate was warmer than today and glaciers degraded completely (Arkhipov et al., 1982). The subsequent cooling led to the development of the Sartan glaciation whose extent in Central Siberia was smaller than that of the Zyryanka, despite the lower temperatures. Only in the north-west of the North Siberian lowland did the Putorana glaciers merge with those of the northern centre located on the Kara shelf (Isaeva, 1984). The position of the end moraines indicates that during the maximum phase at 18-20 Ka BP, the Putorana ice crossed to the western bank of the Yenisey and made the river shift westwards (the evolution of river valleys in periglacial areas is discussed above). It is in the western sector of the plateau that the glacier was most active and reached its maximum extent and a thickness of 1-1.5 km. In the north, valley glaciers merged in the piedmonts. At the southern and eastern margins of the Putorana, ice advanced along valleys, and the frontal parts of the ice sheet were stagnant and did not leave a continuous terminal moraine (Isaeva, 1984; Isaeva et al., 1993). The retreat of piedmont glaciers ended around 15 Ka BP but glaciers continued to exist in the mountains. Thus, between 500 m and 1300 m, end valley moraines recorded eight pauses during the Holocene ice retreat (Maksimov, 1969). The modern relief of the Putorana plateau is a product of epeirogenic movements, faulting, fissure magmatism, erosion, and glacial activity. Typical of the Putorana is a combination of flat watersheds, table mountains, and deep valleys (Figure 13.5). Flat summits (1400-1500 m) and terraces positioned at 700-800 and 1000-1200 m are remnants of the ancient peneplain, while major valleys correspond to faults which are represented by various forms from mature grabens to recent fissures. Most strongly dissected is the western part of the plateau where relative elevations range between 500 m and 1000 m. The hydrographic pattern generally corresponds to the tectonic structures. River valleys are mostly narrow and deep with numerous straight sections. The alternation of basalts, tuffs, and sedimentary rocks and their different resistance to weathering predetermine a widespread occurrence of cornices and breaks in the longitudinal river profiles. Associated with those are numerous waterfalls, a distinct feature of the Putorana landscapes. Similarly, slopes have characteristic profiles with 15-20 levels. Valleys contain numerous lakes which are usually very deep (e.g., Lake Lama, 250 m), long (e.g., Lake Dyupkun, 133 km) and narrow. There are just under 10 000 lakes in the Putorana (Parmuzin, 1975). There are three climatic sectors in the Russian Arctic and subarctic: Atlantic, Siberian and Pacific (Myachkova, 1983). The boundary between the Atlantic and the Siberian sector is positioned at approximately 94°E. The Putorana is, therefore, located at a junction of the two sectors and its western and eastern regions have different climates. The western part of the plateau receives twice as much precipitation as the eastern one, with the annual totals increasing from 300-400 mm in the foothills to 1200-1600 at the top (Myagkov and Kanaev, 1992). The average depth of snow cover increases from 60-80 cm to 100-150 cm and the duration of snow cover increases from 200 -240 to 280-300 days. The modern glaciation is confined to the north-western region (the Pyasina basin) where 19 out of 22 glaciers are located. The equilibrium line rises from 800 m in the north-west to 1300 m in the Khatanga basin located further east. All glaciers are small, with a combined area of 2.5 km2, and develop on the north-eastern slopes where melting is delayed in sites protected from wind. While the medium elevation of the Putorana restricts the formation of extensive glaciation, the prolonged cold season (monthly mean temperatures are positive only between June and August) and sufficient snowfall favour the development of snowbanks. These are often 10-15 m deep and on the eastern and north-eastern slopes they develop into perennial snow packs (Popov and Parmuzin, 1975; Osokin, 1989). Snow patches and snow packs frequently dam streams and small rivers, leading to the formation of summer floods and mudflows. Strong slushflows occur on average once in four years during the thawing period between May and June under the condition of rapid temperature increase; less frequent are mudflows in July-August which develop as a result of intensive rainfall (Perov, 1989). The Putorana rivers have the East Siberian regime distinguished by a high water discharge in late spring following thawing and extremely low levels in winter when many rivers freeze through to the bottom (Figure 5.6). Similar to many other Siberian regions, icings are a typical feature of the Putorana hydrology. Icings develop on the frozen surfaces of streams and rivers and when seepage water freezes. Satellite imaging has shown that about 2000 icings with a combined area of about 2400 km2 and an estimated volume of 3 km3 form every year mainly between 500 m and 600 m (Gienko, 1990). Indeed, 'a land of lakes and icings' seems to be an appropriate name for the Putorana. The eastern part of the plateau, where winter climates are more severe and arid, is particularly prone to their formation. Icings are an important control over river regime: while in winter they can terminate river discharge completely, in summer an additional input of water is provided. Persisting over most of the warm season, icings affect biota and in river valleys and around springs vegetation is often replaced by sand and gravel deposits. The Putorana plateau is located in the cryolitho-zone. In the foothills, permafrost is discontinuous and occupies 60-70 per cent of the area. The depth of permafrost varies between 10 m and 80 m and its temperature is about -3°C. With altitude, continuity and thickness of permafrost increase while its temperature declines (Yershov, 19896). At an elevation of 700-800 m, the depth increases to 100-200 m on the slopes and 300-400 m on watersheds; at 1000-1100 m it varies between 500 m and 800 m and can reach 1100 m at an elevation of 1600 m with the permafrost temperature being as low as -11°C. Therefore, frozen rocks and ground occupy almost the whole of the Putorana and taliks (areas of unfrozen ground or thawed permafrost; see above) occur only under rivers and lakes. The depth of the active layer varies between 1-2 m in the upper parts of the slopes and 2-3 m in the lower sections and in the valleys. The severe climate and permafrost predetermine a widespread development of cryogenic processes and associated landforms (e.g., solifluction, the formation of frost mounds and patterned ground) in the Putorana (Rogozhin, 1966; Fotiev et al., 1974). The formation of block fields and taluses is extremely intensive and occurs on a particularly large scale, partly because of the low temperatures but also because trap has an exceptional tendency towards disintegration by frost weathering. The formation of cryogenic eluvium began in the glacier-free locations during the Sartan and many relict cryogenic features are found alongside the modern ones (Isaeva et al, 1993). The continuing uplift of the plateau intensifies the formation of block fields and block streams (termed kurums) and their downslope movement. Until the 1970s, the vegetation of this region was only known through the early works of Shumilova (1939, 1964). However, as a result of extensive botanical surveys subsequently conducted in the region, the Putorana has become one of the most thoroughly studied regions in the Russian Arctic and subarctic. The findings of this research programme are summarized in a monograph Flora of the Putorana (Malyshev, 1976a). Most of the Putorana plateau is located in the subzone of the northern taiga represented in this area by sparse forests. Altitudinal gradients exist in the distribution of vegetation but in comparison to the mountains in the south or in the west, the vertical vegetation sequence is simple. Three major altitudinal zones are distinguished: sparse forests and forest-tundra (extending to 300-400 m in the north and 700-800 m in the south); alpine tundra (reaching 1200-1400 m) and polar desert. A narrow belt of shrubs, composed mainly of Alnus fruticosa, Salix spp., and Betula папа, separates the sparse forest and the alpine tundra zones and is sometimes recognized as a separate belt (Kuvaev, 1980). In the western part of the plateau, the forest zone is better developed. Forests are composed mainly of Larix sibirica and L. gmelinii (in older texts referred to as L. dahurica) and have a developed undergrowth of Alnus fruticosa and Betula nana. The western part of the Putorana is positioned at a boundary between the dark taiga and the larch taiga, and forests dominated by two species, Picea obovata and Larix sibirica with the participation of Betula tortuosa occur. Eastwards, the composition of forests becomes extremely poor. Larix gmelinii is one of very few woody plants that can tolerate the extremely low temperatures, aridity and thin active layer and sparse forests in the eastern Putorana are composed solely of this species. The alpine tundra vegetation is represented by dwarf shrub, moss, and lichen communities while crust lichens are the main plants in the zone of polar desert. The alpine belt widens towards the north where the forest belt occupies limited areas or is even absent. With the exception of the south-western part of the Putorana, soils are poorly developed (Sokolov and Tonkonogov, 1975). The soil cover is usually thin, rocky with a thin layer of turf or peat near the surface. The cryogenic mixing of the ground prevents the development of a differentiated profile. The flora of the Putorana comprises 576 species and is represented mainly by the circumboreal and amphi-Beringian (i.e., common on both sides of the Bering Strait) species for which the Putorana is the westernmost limit of distribution (Malyshev, 19766). While there is a close affinity between the Putorana and Beringia, notable gaps exist between the Putorana and the main distribution centres in Western and Central Siberia (Yurtsev et al., 1971; Nimis et al., 1995). Vodopyanova (1976) suggests that the existance of such gaps and the occurrence of the Pliocene relicts, such as Rhododendron aureum, point at a possible refugial role of the Putorana during the Pleistocene glaciations. This view contradicts the concept of cover glaciation of the Putorana and supports the existence of ice-free areas and relatively warm habitats during glacial times. Alternatively, the more heat-demanding plants could have reached the plateau in the warmer periods surviving later only in the protected sites on the south-facing Putorana slopes (Nimis et al,, 1995). Despite its remote location and the hostile environment, the Putorana accommodates considerable economic activity. Already in the 1920s-1930s, the vast deposits of copper and nickel ores were discovered in its western foothills and production at the Norilsk Metallurgical Combine began in 1942. At present, the town of Norilsk has a population of over 160000 and is one of the world's largest Arctic settlements. The Norilsk Combine is the leading producer of non-ferrous metals and, similarly to the smelters of the Kola peninsula and Sudbury (Ontario, Canada), it is a source of environmental degradation of a catastrophic scale. These issues are discussed below.